Description: This tea contains herbs high in minerals often not found in our foods. Herbs high in potassium chloride dissolve and is designed to help in cases of fibrin (the cause of catarrh), blood clots, fibroids, cancer and tumors, etc. Ingredients: Burdock Root, Dandelion Leaves & Root, Irish Moss & Bladderwrack, Kelp, Licorice Root, Alfalfa, Flax Seed, Elderberry Blossoms, Icelandic Moss and Stevia. Description: This tea is formulated with herbs to aid in conditions of Asthma, Bronchitis, Pneumonia, Tuberculosis and other Respiratory Problems. 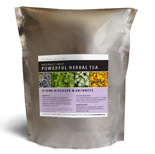 Ingredients: Healing Herb Root, Licorice Root, Mullein, Elecampane Root, Irish Moss, Kelp and Stevia. Description: Diaphoretic herbs influence the entire circulatory system and increase perspiration for Colds, Flu, Fever, etc. Ingredients: Peppermint, Elderberry Blossoms, Boneset, Yarrow Blossoms, Irish Moss (kelp), and Stevia.